New book cover for 2nd edition, the biography of Rama - Dr. Frederick Lenz. Love creates a bridge, a bridge between peoples, a bridge between nations. The absence of love is war, hate, enmity, fear. Mystic Buddha Publishing House presents Valentine’s Day tips on different forms and views of love, as expressed in Blue SKies Buddha, the biography of Rama - Dr. Frederick Lenz. According to Publisher Roger Cantu, “Blue Skies Buddha is in fact a love story, the love of a Buddhist teacher for teaching and helping others. Valentine’s Day celebrates love in all its forms, and Blue Skies Buddha reminds us of an underlying love that resonates." --- When we love it takes us beyond our self, otherwise we're just absorbed with the preoccupations that we invent. But when we love someone, we can do something magnificent. We look beyond our own immediate needs and we become more concerned about the welfare of another. --- In the process of the years of meditation and self-giving, self-analysis, I found that I no longer loved as I had formerly done. As I went on, the relationships got better and better. And they meant less. The relationships that I had became more and more impersonal, yet had more love in them. It's an odd incongruity. I loved more but I was less attached. In other words, my love was no longer bound by the body, it was a love of spirit. --- I’m trying to tell you that life is so much better than you can imagine. That eternity is so complete, nirvana is so perfect and shining, but you’re just skimming it. You’re missing it. And that’s a part in the process. But if you just reach a little more, if you just extend your self-giving, your love, a little deeper, if you just try a little harder in your meditations, it’s endless, it’s perfect, it’s beyond anything that you can imagine. And I would like that for you. --- [Referencing meditation journeys to the desert, where he zoomed yards across the sand without touching it] If I believed there was a physical, I could not do this. We walk upon the Grace of God. Nothing else exists except that. It’s like gliding. You walk just above the physical. You only walk or live this way if you have a terrific love for Existence. If you have total faith and love then that which you love will help you. Then you can walk on anything. --- When I find myself coming back to this world, I realize it's because of love. Love is the strongest force in the universe. You can travel to all the multifarious realities – infinite planes of awareness – merge with them and become them. Yet, if love is lacking, it will all remain flat. If love is lacking in your consciousness, your awareness will be dry. You will be empty. If you love enough, you can do anything. --- About 75 to 95 percent of all attention in this world is devoted to romance. And it's such a waste, it's incredible, because you get almost no return on your investment – it’s power lost. I think you need to look at yourself a little bit and assess how much of your energy you're putting in that direction. I have no argument with romance or with love but if you're fixating on it too much, you'll find that you're losing a tremendous amount of energy. --- You can store power through love. Whenever you love, you compress time. Time stops. The world stops and you step outside of it. --- Love creates a bridge, a bridge between peoples, a bridge between nations. The absence of love is war, hate, enmity, fear. --- Relationships succeed when both parties are giving. If either partner stops giving, the relationship ends. When both partners are giving, always finding new ways to give, the relationship always stays fresh. 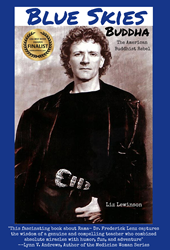 There is more to love and awareness than most people realize," says Lewinson. "That is the good news." Blue Skies Buddha is currently available on Amazon, Barnes & Noble, and bookstores worldwide. For further information on Blue Skies Buddha, contact info(at)mysticbuddha(dot)com or visit http://www.blueskiesbuddha.com.